Now in their 22nd season, Voices of the Ascension is an ensemble of exquisite refinement and expressiveness. Although they do travel and perform, we in New York tend to feel rather proprietary about this wonderful group. And while they give the people of New York the gift of music all year round, Christmas is always rather special. I reviewed the choir on their home ground two years ago (Read here) just as they were about to set off on a pilgrimage around the city occasioned by refurbishment of their church and the impending arrival of a new French organ. They are once again back home this season, but they also paid a visit to the Metropolitan Museum’s incomparable venue for holiday music, the Medieval Courtyard. Theirs was a varied program beginning with two versions of “Ave Maria.” The first, by Victoria, resounded through the stone courtyard like a rich carpet of sound, all enveloping, with marvelous dynamic nuance and the final amen almost imperceptibly subsiding into silence. Again, there was premiere of the aptly titled “A New Song”, a work by the almost alarmingly productive young composer, Nico Muhly – this time, unlike the Davies Carnegie Hall recital three days earlier (Read here), just the US premiere, Zurich having had the honor of hearing it first. The piece was rhythmically interesting with male voices juxtaposed against the female and one or the other acting as a kind of accompaniment. But the work Muhly wrote for the Davies recital debut was on an entirely different level. 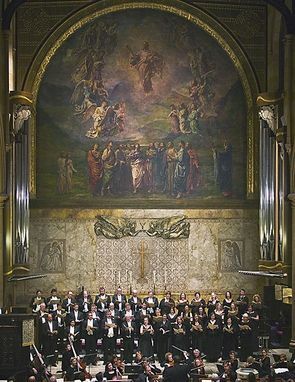 Before the choir began to sing Messiaen’s sublimely beautiful “O Sacrum Convivum”, Maestro Keene shared a special story with us – his fond memory of accompanying the composer on a visit to our venue, The Metropolitan Museum. The choir sounded luminous, hushed yet sensuous, as they negotiated Messiaen’s subtle harmonies. Of the Christmas Carols, the vibrant and infectious gospel tune, “Go Tell It On The Mountain,” made it very difficult not to tap one’s feet. My favorite parts of the program were the Russian works – two by Rachmaninoff – a glorious “Ave Maria” and a stunning excerpt from his Vespers, “Slava Vvyshnikh Bogu” (Glory to God in the Highest) – marked by striking diminuendos and a gorgeous hushed quality. The encore by Nikolai Tolstiakov, was the otherworldly “Blagoslovi, dushe moya, Ghospoda” (Bless the Lord, O My Soul), a work that simply casts a spell. As performed by the Voices of the Ascensions that spell was a magic one indeed.